History: (What If? II#2 (fb)) - When Karen Page sold Daredevil's secret identity, the information found its way to the Kingpin, who used the information to ruin Matt Murdock's life. (What If? II#2) - Contemplating killing the Kingpin in revenge, Matt Murdock entered the Kingpin's skyscraper and passed through security with no problem. Once inside, Matt pretended to stumble, during which he stole the unaware security guard's gun and used it to kill the Kingpin in cold blood. He then walked outside and into an alleyway, where the guilt began to drive him insane. Realizing that he needed to turn himself in, a crazed Matt tried to "turn him in" to a local drunk and then avoided the real police, thinking them to be agents of the Kingpin out for his blood. Soon after, the Hobgoblin arrived at the HQ of the Rose, who cut his ties to the Hobgoblin, claiming that his priorities had changed in the wake of the Kingpin's death. The Rose then went to his shooting range where his lackey Johnston informed him that the gang war caused by the Kingpin's death had now claimed Vanessa Fisk as well. 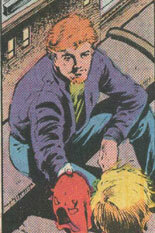 While the Rose began to contemplate killing Matt in retaliation for the deaths of his parents, Matt had stumbled his way into the Punisher, whom he begged to kill him. The Punisher quickly realized that Matt was not right in the head and refused. Spider-Man soon arrived as well and both Spider-Man and the Punisher tried to capture Matt for his own good but Matt managed to turn the heroes' weapons against them, effectively immobilizing them both. During the battle, Matt realized who he needed to find to receive the judgment that he was craving and as he ran through Hell's Kitchen in search of his destination, Karen Page was killed by her "protector" Paulo in Sister Maggie's church. When Richard Fisk cut his ties to his friend Alfredo when Alfredo protested Fisk's intended murder of Matt, Matt himself arrived at Fisk's front door and begged for either forgiveness or punishment. Richard thought long and hard about killing Matt but before he make his decision, the Hobgoblin burst into Richard's apartment and announced that his first assignment for his new partner Hammerhead was to kill Richard. A battle quickly ensued, with the Hobgoblin attacking Richard and Matt trying to defend Richard. When the Hobgoblin lit a pumpkin bomb, Matt knocked it from his hand where it got stuck in the Hobgoblin's Glider. Panicking, the Hobgoblin tried to fly outside, begging for help from his hated enemy Spider-Man as the bomb went off, killing both Hobgoblin and Matt Murdock. Moved by Matt's sacrifice, Richard granted Matt the forgiveness he was seeking and became the new Daredevil in Matt's honor, using circuitry in his mask to mimic Matt's radar sense. Comments: Created by Danny Fingeroth, Greg Capullo, Ian Akin, and Brian Garvey. This reality's divergent point occurred during the events seen in Daredevil I#227-233 (February-August, 1986). Like his Earth-616 counterpart, Alfredo was a friend of Richard Fisk. He supplied him with technology that was used first in his identity as the Rose and later as Daredevil. When Richard told Alfredo that he planned to murder Matt Murdock in retaliation for his parents' deaths, Alfredo announced that he would have no part in it and parted ways with Richard. Once Richard had decided to become the new Daredevil, Alfredo added circuitry into the Daredevil mask that imitated Matt's radar sense. Charlie was a policeman who was on the watch for Matt Murdock following Murdock's murder of the Kingpin. When his partner commented about how Murdock was the killer, Charlie made a crack about Murdock's blindness to which his partner got a good laugh. Neither Charlie or his partner noticed that Matt had escaped right behind them. 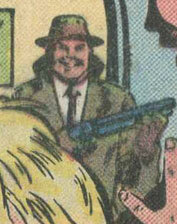 Originally using the identity of the Rose, Richard Fisk worked under the disguise of a crime boss while secretly plotting to take down his father, the Kingpin. When the Kingpin was murdered by Matt Murdock and his wife Vanessa was also killed during the gang war that ensued, Richard was determined to avenge their deaths by murdering Matt. When Matt showed up at Richard's apartment, Richard contemplated killing him until the Hobgoblin burst in and tried to kill Richard for Hammerhead. Matt instinctively defended Richard from the Hobgoblin, eventually dying with the Hobgoblin when one of the Hobgoblin's pumpkin bombs got hung on his glider and exploded. Moved by Matt's defense of him, Richard decided to give Matt the forgiveness that he wanted and then decided to honor Matt by continuing his legacy as the new Daredevil. 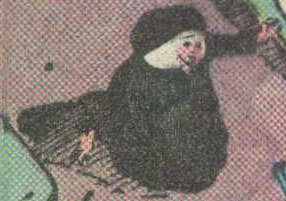 Using technology supplied to him by Alfredo, Richard was able to mimic Daredevil's radar sense. Ned Leeds was a reporter (like his Earth-616 counterpart) who was also a costumed villain with dreams of ruling the underworld. He worked for the Rose until Richard Fisk cut ties with him following the deaths of the Kingpin. Opting for more power, the Hobgoblin then allied himself with Hammerhead and as his first assignment, he was sent to kill Richard Fisk. During the battle against Richard, the Hobgoblin was attacked by Matt Murdock and when he attempted to use a pumpkin bomb, Murdock knocked it from his hand, causing it to lodge itself onto the Hobgoblin's glider. Panicking, the Hobgoblin flew outside of the apartment where the bomb exploded, killing both him and Matt Murdock. 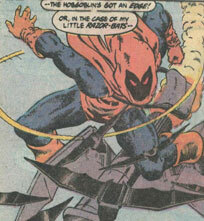 The Hobgoblin used a glider, razor-bats, pumpkin bombs, and gloves that fired electric blasts. Johnston was a lackey of the Rose who informed him that Vanessa Fisk was dead as a result of the gang war that had ensued following the death of the Kingpin. Wilson Fisk was the same as his Earth-616 counterpart up until Matt Murdock confronted and killed him for using his secret identity against him. His death sparked a citywide gang war. Sister Maggie was a nun who cared for Karen Page when Karen arrived seeking help from her "protector" Paulo and her own drug abuse. While she was shaking due to heroin withdrawal, Karen was confronted by Paulo. Sister Maggie begged Paulo to leave the church but Paolo killed Karen anyway. 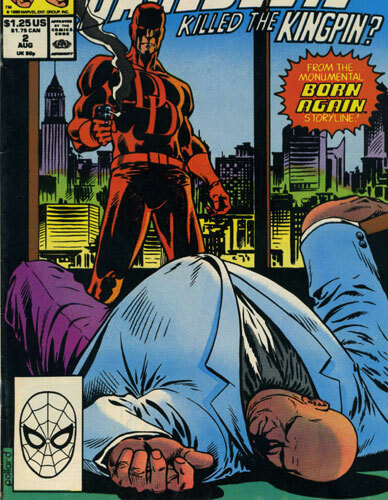 Originally the costumed hero Daredevil, Matt's identity was revealed by the Kingpin, who ruined his life. In retaliation, Matt confronted the Kingpin at his offices and killed him in cold blood. Realizing that he had betrayed everything he stood for, Matt began to lose his grip on reality due to the guilt and opted to turn himself in for his crimes. Unfortunately, in his crazed state, Matt began to hallucinate that a local drunk was a judge and later thought that the real police were agents of the Kingpin. Eventually stumbling into the Punisher, Matt begged him to pass judgment on him but the Punisher declined, realizing that Matt was having some sort of breakdown. Spider-Man soon arrived and both he and the Punisher were immobilized when Matt turned their weapons against them. He eventually made his way to the apartment of Richard Fisk, where he begged Fisk to either forgive him or punish him. Before Richard could make up his mind what to do, the Hobgoblin attacked. 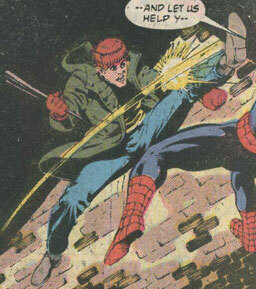 Matt instinctively defended Fisk until both he and the Hobgoblin were killed by one of the Hobgoblin's pumpkin bombs. Like his Earth-616 counterpart, Matt Murdock had superhuman senses and a radar sense that allowed him to know his surroundings. Karen Page was the same as her Earth-616 counterpart, having sold Daredevil's secret identity for drug money. Once the identity had fallen into the hands of the Kingpin, he sent agents to kill her. Karen hired a "protector" in Paulo but eventually ran from him as well, arriving at a local church in Hell's Kitchen where she begged for help with Paulo and her own drug abuse. While Sister Maggie was caring for her during her heroin withdrawal, Karen Page was killed by Paulo, who had tracked her to the church. Paulo was a "protector" who Karen Page hired to help her escape the Kingpin's men but Paulo's price was that he would own Karen as his own object. When she ran from him as well, Paulo tracked her to a local church and killed her in front of Sister Maggie. The Punisher was the same as his Earth-616 counterpart up until he ran into a crazed Matt Murdock following the Kingpin's death. Realizing that Matt needed psychiatric help, the Punisher offered to help and attempted to capture Matt for his own good. Matt fled, running into Spider-Man as well, whose webbing his used to immobilize the Punisher and escape. 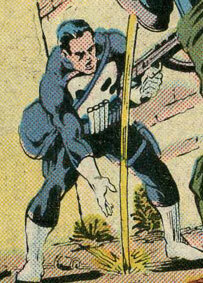 Like his Earth-616 counterpart, the Punisher used a whole lot of conventional weaponry. Peter Parker was the same as his Earth-616 counterpart until word of Matt Murdock's murder of the Kingpin reached him. He quickly set out to find Matt and find out what had happened. When he did find Matt, he found the Punisher trying to apprehend Matt for his own good and attempted to help. 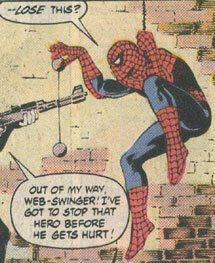 Unfortunately, Matt used the Punisher's gas grenades against Spider-Man who instinctively tried to web Matt up but he ended up webbing the Punisher instead, allowing for Matt to escape. Spider-Man had superhuman strength, agility, and a spider-sense, like his Earth-616 counterpart. 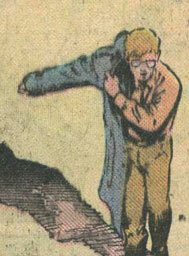 Ben Urich was the same as his Earth-616 counterpart up until news of Matt Murdock's murder of the Kingpin reached him. Knowing that Matt was Daredevil, Urich immediately set out to find Matt. Unfortunately, he never found him.